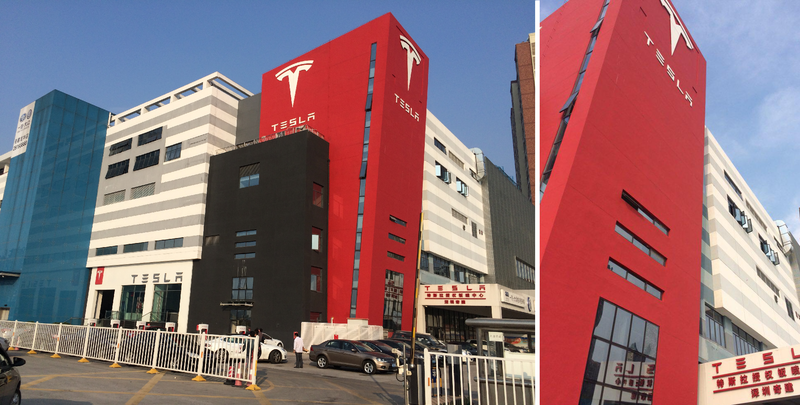 Tesla has some impressive retail locations around the world, but this one in Shenzhen, China looks particularly awesome. Located in Longhua District, the store is in a mall specialized in auto sales called “Longhua Auto City”. Shenzhen is located in mainland China, just the other side of Hong Kong, and has a population of over 10 million (18 million in metro area), which makes it one of China’s many “mega-cities”. In order to limit traffic and pollution from transport, some cities in China implemented a lottery system which limits the number of license plates available and can even double the price of buying a vehicle. Last year, Tesla’s vehicles were approved for the city’s “new-energy vehicles” license plate program, which bypasses the normal lottery system to get a license plate and makes it significantly cheaper. Tesla’s Model S was added to the list of approved vehicles in March 2015, and it presumably helped the company’s sales in China, which were lagging until the second half of last year. We don’t have the deliveries for the fourth quarter 2015 yet, but we know that Tesla delivered 3,025 cars in China during the first 3 quarters of 2015.